Day 2745 - Week 393 - Thursday 14th June 2012. Day 2745. Thursday 14th June 2012. 08.00 .. Off to Frimley Park Hospital for the pre op checks for my shoulder joint operation on 6th July. Can't help thinking that it should be done closer, after my 12 day trip to Brunei starting Monday. I'm sure they know best. I shouldn't say this, I might be deemed as totally mad .. but I think that inanimate object, my TomTom is trying to wind me up. After nearly a month of hassle and grief, many hours of chat with TomTom customer support .. to the level of completely reformatting the TomTom and installing everything from fresh .. it still wouldn't work (as in live traffic updates). Monday they reregistered my Sim card .. they assured me all would be good following another software rebuild Monday night. Was it heck !! No updates Tuesday or Wednesday, non this morning. So I called the supplier who had offered their own 2 year warrantee this morning who issued returns info .. Phew. Get in car tonight and switch it on, along with my Phone running Waze app on it. Within 20 seconds or so my TomTom was reporting traffic on the M25 totally stuffed and offered me a faster route (something that hasn't happened for weeks). Did I believe it .. NO, because Waze said everyhting was fine !!! So went up M40 from J1 and found M25 backed up to M40 .. drove on ( new alternate route on TomTom ) .. Waze said nothing about M25 traffic !!! The air in my car went rather blue as I faced my extended journey home. Now what should I do !!! Day 2746. Friday 15th June 2012. Physio stress test at Frimley Park Hospital at 14.00 .. oh what joy. But hey it's Friday .. shame about the weekend weather forecast ..
20.30 .. ish .. My mobile phone rings .. it’s Christine from Whitby .. she has a spare ticket to attend Henley Royal Regatta, Sunday 1st July .. in the Stewards Enclosure. I feel honoured, as this is an invitation only enclosure with very strict codes. I might have to go and buy a dress. Just hope I'm not too jet lagged 2 days after returning from Brunei. I will enjoy, especially as I used to row for Staines Boat Club in the early 70's !!! Day 2747. Saturday 16th June 2012. It’s the Saturday morning weigh in .. 14st 11 1/4 lb .. going down !!!!. After a bit of an up and down day, had a really nice evening meal out tonight with Karen and Jenny Day. Visited a place, Domingos in Northfields, that Karen and I used to frequent a lot a few years ago, with another very missed friend Jessica Bussert and her partner. Rosa, one of the waitresses asked after Jessica tonight, and we will be going back soon again, the food was really lovely, so was the sangria !!! Day 2748. Sunday 17th June 2012. Most of my day is spent packing for my flight to Brunei tomorrow ..
Have decided not to take my own laptop, just the company one so any emails are going to have to wait till the 29th, ho hum, wish there was a Mozilla Thunderbird for Android !! Off to bed for a last cuddle .. nightie night. Day 2749. Monday 18th June 2012. 05.10 .. The alarm ..
06.25 .. Bob, my taxi man, arrives outside and loads my bags into his Chrysler Voyager ..
07.03 .. I’m inside Terminal 4 and soon find Nick .. check in and then find breakfast number 2 ..
08.18 .. The last possible taste of bacon for 12 days ..
09.03 .. Now boarding at gate 23 ..
09.25 .. Now on board BI098 seat 38H waiting for the prayers to start .. oh yes, try flying Royal Brunei to find out ..
17.20 .. We land in Dubai ..
17.34 .. We are in Macdonalds .. to fill Nick up as he won’t eat airline food .. it would be rude if I didn’t join him ..
20.25 .. We are taxing again ..
Day 2750. Tuesday 19th June 2012. Day 2751. Wednesday 20th June 2012. 07.00 .. The alarm .. a quick shower then head down to meet Nick for breakfast ..
08.05 .. Breakfast in Brunei is a pretty poor affair ..
23.10 .. One of THOSE days in the office .. followed by not the best of Indian Curries .. now off to bed before the next day starts too soon .. yes 7am this morning did feel like 24.00 even though I slept pretty well feet up on 3 pillows. Waves seem to be roaring louder tonight .. maybe my hearing has returned fully post flight .. trying to be good with aircon now set at 27c .. nightie night. Day 2752 - Week 394 - Thursday 21st June 2012. Day 2752. Thursday 21st June 2012. 09.10 .. In the office ..
14.55 .. Nick ( colleague ) and I are about to take our VSAT link off air here in Brunei .. we've given ourselves a 3 hour window to do some essential maintenance on the UP side of the link, then test out the backup chain .. it's going to be V hot working in the sun .. ho hum ..
Up on the roof of our Vsat cabin .. It's a big dish for several reasons, it's C-band, and we are on the fringe of the service area, low on the horizon .. colleague Nick took the picture. Spot the bird spikes I've attached to the LNA mount .. that should stop horn bills pecking holes in the end cover, which keeps the system pressurised with dry air from an air drying compressor a few feet below where I'm standing ..
Day 2753. Friday 22nd June 2012. Day 2754. Saturday 23rd June 2012. 07.45 .. The alarm .. but it failed to wake me ..
08.59 .. Morning world .. alarm failed to go off this morning, looked at phone as it went 08.59 - 09.00 .. should have woken up at 07.45 to sort my hair. Got to sort something for a friend then off to help out the station staff at the Panaga Highland Games .. it's a sort of community fun day. Nick and I have agreed to man the stall from 13.15 to 15.00 .. possibly the hottest part of the day .. only mad dogs ( me ) and English gentlemen ( Nick ) go out in the midday sun. 01.30 .. is looking forward to getting home to be with Karen who I really miss, hopefully next Friday, but I'm aware an extension maybe needed .. I want to be cool again and not via aircon only ..
Day 2755. Sunday 24th June 2012. 07.00 .. The alarm .. time for a quick shower, go sort out some breakfast and then wait for Steve & Dorothy to collect us ..
08.30 .. Steve and Dorothy collect us ..
00.38 .. It’s been interesting day in the Bandar area of the capital, here in Brunei. Did a visit to quite a shame full zoo and met a seriously gentle orangutan who was reaching out to touch us. She ( obviously ) seemed wary of me initially, but then let me stroke her head and tiggle her ear as she pressed her head to the bars. The rest of the day was very pleasant too. 00.55 .. Oh, and tonight I'm sharing my hotel room with a ruddy lizard .. about 4" long, as I came into my room and turned the light on it shot across my carpet and ran under the desk / dressing table I'm sitting at now .. these anemic looking things are quite harmless .. but I'll be wearing knickers in bed and checking all my things very carefully from now on .. it may have been here all week hiding !!! .. but suspect it got in while the maid had the door propped open while she did her daily "clean" .. inverted commas for a reason. Day 2756. Monday 25th June 2012. 07.23 .. Morning world .. another week starts and colleague Nick and I have got our time cut out .. 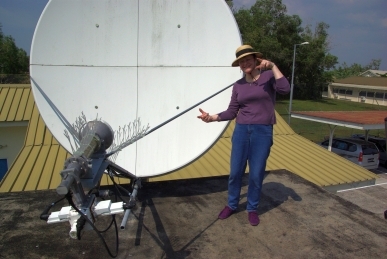 I suspect another part day spent on the roof with the dish .. we've got to work out which part is faulty today ..
23.52 .. Ok .. the lizard I saw yesterday .. it's got a friend, a bigger one. For quite a few mornings I'd been woken in the early morning, at sun up, by this strange noise that I thought were birds on my "balcony". No it was my lizard friend .. but he had another friend who it was calling too. As I looked out of my bathroom I saw it run across my wall, bound over the aircon unit and disappear behind my curtains ..
Day 2757. Tuesday 26th June 2012. 19.30 .. at Kuala Belait Boat Club with Nick, Steve and Dorothy for a meal .. idyllic, on the balcony looking down stream 40 minutes after sunset with the sky on fire glowing red .. with all the wildlife giving it some with the sound effects, it was just amazing !!! Day 2758. Wednesday 27th June 2012. 07.00 .. The alarm .. up and at it .. last full day in the office ..
23.52 .. So dream on .. how much does it cost to put 56 litres of Diesel in the company Suzuki 4x4 here in Brunei .. with service, so I didn't have to get smelly diesel hands and I got a hand written receipt from the attendant ? There'll be a stampede of emigrants out here when you know .. B$ 17.50 = £8.74 !!! 00.27 .. I’m packing my case when the hotel shakes .. oo er .. an earth tremor I am sure ..
Day 2759 - Week 395 - Thursday 28th June 2012. Day 2759. Thursday 28th June 2012. 06.45 .. Up and at it .. was up till 01.30 re-packing !! it's going to be a very long day till I can collapse in bed in the UK, I just don't sleep very well on aircraft, especially in economy .. so one 31 hour day coming up !!! 16.00 .. The taxi arrives to take Nick and I to the airport .. sad to leave here, the warmth, especially from Steve, Dorothy and Sarah ..
17.30 .. We check in and get fleeced by Royal Brunei for being over weight a couple of Kg ..
18.30 .. A Pepsi and a muffin ... some flight fuel. One thing is for sure, you still don't want to powder your nose here, Brunei has the worst toilets of any airport I’ve been through .. by a long distance .. YUCK !!! 20.10 .. The plane takes off on our first leg to Dubai on our journey home ..
Day 2760. Friday 29th June 2012. 04.00 ( Brunei time ) .. Half way home, in Dubai .. means Macdonalds with Nick ..
13.02 (Brunei) .. 06.02 .. UK .. Touchdown at Heathrow airport ..
06.24 .. What the heck .. already through immigration .. something must be wrong today, and clearly two of the people on the UK passport section are trainee’s ..
06.54 .. My case finally arrives and Nick and I walk out to find our drivers .. Bob from Windlesham Chauffer Services is right on the end of the barrier waiting .. he offers to take my trolley, I keep hold of it, it’s holding me up !! 07.25 .. I’m home .. Bob carries my heavier bags and places them inside the kitchen door and heads off ..
07.35 .. Karen finally appears downstairs .. I get the hug and kiss I’ve been longing for ..
07.50 .. Karen heads for work ..
09.30 .. I lug my cases up stairs and unpack .. easier said than done, I’m exhausted. 10.25 .. I head for the shower ..
11.00 .. I’m in bed ..
15.05 .. I wake with a start .. better get up ..
21.30 .. I head for bed ..
21.58 .. I climb into bed .. I feel a little chilli ..
22.20 .. ish .. Karen appears time for a cuddle ..
Day 2761. Saturday 30th June 2012. 03.05 .. I’m awake .. it’s 10.00am in Brunei so I’ve probably slept 3 hours later than I would have there .. but it’s too early ..
08.35 .. I wake with a start as Karen brings a cup of tea ..
12.45 .. I head for a shower, but get way laid by some necessary cleaning ..
14.15 .. Showered, it’s a meagre lunch .. a little cheese and some crackers ..
15.05 .. I head for Lightwater .. DIY shopping for mother and a car wash for Violet ..
17.35 .. Time to head to mothers ..
Day 2762. Sunday 1st July 2012. 05.00 .. I’m awake .. too early, but that’s an improvement on yesterday ..
09.24 .. I’m on the road in Violet ..
10.02 .. I arrive at Christine’s hotel near Loudwater, she’s waiting .. I get into her car and we head off for Henley. Well what an interesting day .. up fairly early, I woke up at 05.00 this morning .. so maybe tomorrow back to normal .. maybe. The day was spent at Henley Royal Regatta, for which I was very much appropriately dressed for the Stewards Enclosure .. but .. I'd not worn that white sun dress before, despite buying it 2 years ago in Long Tall Sally's sale. I was aware it was a little revealing, but never before have I had men stare at me ( them ) like that before. It was a strange feeling, but quite a confidence boost ;-). The weather was a lot colder and drizzly at times than predicted, such that I got goose pimples .. lucky I had taken the cardy with me, I was surprised how cool 19 / 21 c was compared to the mid 30's I was living in last week. We took a walk along the river bank through the common people (;-)) towards the start, half way back my legs starting getting jelly like, an empty chair was a welcome sight back in the enclosure. 16.10 .. Christine wants to escape to avoid the crowd .. so be it. 16.55 .. ish .. We are back at Christine’s hotel .. seems she thinks I should go home and catch up on sleep .. so be it ..
17.41 .. Post fuel stop in Egham .. I’m home. 19.18 .. Dinner is served .. a ham and cheese salad ..
Day 2763. Monday 2nd July 2012. 03.05 .. DOH .. what time did I wake up again this morning .. DOH. 19.30 tonight there was a knock on my front door. I opened it. The chap standing there was allegedly from the insurance BROKER of the Transphobic BMW driver who abused me on 22nd Feb this year after he cut me up and damaged my car. He showed me an ID card for Quinn Insurance. Apparently, his client has now admitted liability, and he was visiting to make sure I was OK and that our car had been repaired. The hand written envelope he passed me had the correct name, address and post code on it. The letter inside had my first and family names spelt wrong, and also gave the rare name of the third party, who from doing a search may live a few miles away in Weybridge. My concern is, having taken great care with Surrey Police, my insurance company and the DVLA to ensure my information was secure and locked down to stop make sure the third party could not find out where I lived .. his "broker" now clearly knows, how close is he to the third party and would he have shared my details ??? Day 2764. Tuesday 3rd July 2012. So I made the calls eventually this morning, a little busy with just me in the office out of 5 .. The Police had no concern at all that I'd had this cold caller at my door last night, other to assure me it wasn't them who let my information out. They suggested calling my insurance company. So I then called the chap who called last night, using the information on the letter. He was acting on behalf of the other insurance company and he had been warned of the back ground of the incident and was aware of the consequences of communicating any personal information to the third party. He was really nice, and has assured me that he won't be contacting the third party in anyway. His visit was just to ensure I was happy with my repairs. My insurance company had been called by him this morning to let them know the third party had accepted liability, restoring our no claims and I'll receive a cheque within the next 28 days or so for the excess we had to pay on the repair..
Day 2765. Wednesday 4th July 2012. Day 2766 - Week 396 - Thursday 5th July 2012. MDay 2766. Thursday 5th July 2012. .. has to be at Frimley Park Hospital for a 07.00 check in at the day surgery unit for an operation on my shoulder tomorrow, Friday .. :-( .. got the weekend to recover. Got a bag packed .. got my hospital book to continue reading .. 7 years and about 5 day jobs since I started it, about 1/2 way through it .. Griff Rhys Jones - To the Baltic with Bob .. it's a funny book about sailing. I didn't sleep well last night and probably won't tonight .. hopefully tomorrow I'll sleep well. Did I mention it's a Claire weekend coming up .. we'll see :-(. 23.01 .. I climb into bed .. no comfort here ..
Day 2767. Friday 6th July 2012. 04.05 .. I take a drink of water .. well it did say till 05.30 in some of the paperwork ..
05.00 .. The alarm ..
05.05 .. Up and at it .. straight downstairs to take an Elleste Solo with a sip of water ..
06.15 .. Hair dried, I go do a weigh in .. 14st 9 3/4 lb .. or after flipping the switch on the scales, 93.4Kg .. have to see what the hospital scales say. 07.50 .. The scrub nurse comes to collect me and wheels me off towards theatre 11 .. but there’s a delay when I get there ..
08.01 .. As I’m wheeled into the anaesthetic room .. the surgeon appears briefly .. he wants my wedding ring moved to my other hand, he expects my left arm to swell considerably when they pump it full of water. The anaesthetists female junior, and the scrub nurse do the best to distract me as they work on me. The male anaesthetist suddenly appears, leans across me and squirts a small syringe of clear stuff into the cannular on the back of my right hand .. “that’ll make you woozy in a few moments” .. he barges past the scrub nurse and returns with a much larger syringe of white stuff. He attaches it to the cannular and tells me to relax ..
Last thing I remember is looking at the clock .. 08.08. I wake up in agony .. a nurse is rubbing my hand and telling me to open my eyes .. a clock behind her says 10.10. Gosh my shoulder hurts .. in goes a small syringe of morphine .. no effect. I drift in and out of conscious for ages, there’s quite a bit of activity around me. More morphine goes in then they try something else. The morphine affects my breathing apparently, and the two nurses by me keep waking me up telling me to take deep breaths .. I hear one tell another that when I drift off my breathing is too shallow and my O2 drops below 85% .. then wake me up ..
Other patients come and go .. I’m kept on oxygen .. I’m so thirsty .. the nurses keep plying me with water ..
11.45 .. somebody comes to ask if I’m going back to the ward .. I’m a little more with it .. a nurse says no, I need closer monitoring than the ward is set up for as the morphine has reduced my O2 level ..
13.15 .. I’m wheeled back to the ward with a small oxygen cylinder placed beside me on the bed.. the ward sister is a little concerned at my late return and still on oxygen ..
14.30 .. ish .. they try me without oxygen for a while .. I’m desperate for the loo, a nurse helps me across the corridor and into the disabled loo .. I struggle back to bed .. I’m boiling .. I’m put back on oxygen again and a fan is found to play on me ..
15.45 .. ish .. I’m taken off oxygen again, this time all seems well. 17.15 .. Two of the other women have gone, the third is getting ready, I ask when I can go home. The nurse is a little concerned and chats with me about how I feel .. but then says I can call Karen to come and get me ..
17.30 .. The other 3 women have gone, I’m all alone, waiting for Karen ..
18.25 .. ish .. Karen rings me from down the corridor ..
18.40 .. ish .. We leave the ward .. gosh I feel weak and before I’ve got to the front door I’m feeling quite faint .. stopping several times. I cross the road to the car park, clinging to railings .. I feel as if I’m going to pass out. I finally make it to the car ..
19.05 .. ish .. We stop in Bagshot to collect the Chinese .. I am hungry .. but not sure how hungry ..
19.25 .. We are home .. So the Chinese fortune cookies tonight .. "POPPY IS YOUR LUCKY FLOWER" and then "YOU WILL HAVE GOOD LUCK AND OVERCOME MANY HARDSHIPS" ..
Well the first is where morphine comes from, and they gave me a lot of that in recovery .. they then had to keep me there so they could watch me closely cause it affected my breathing, kept being woken up and told to take some deep breaths as my O2 dropped below 85%, I heard one nurse tell another. The second one rather explains a lot of my life so far .. I hope to be able to continue this for a while longer, and now with less pain..
21.15 .. I head up for bed ..
Day 2768. Saturday 7th July 2012. 10.50 .. We arrive at Northampton services .. Claire seems happy enough. 13.10 .. We are home ..
Claire's home and being really good - phrase of the day "dad's hurt her arm". Volterol & Codrydomol not having great effect on arm in sling .. but layed on bed is ok. Got to go see my mother sometime .. definitely need more pain relief to cope with jer too ;-) :-( .. back on my bed. 18.02 .. We are home .. I order the Pizz, karen goes to collect it ..
20.20 .. Claire is in bed ..
20.45 .. I head for bed ..
21.30 .. Karen turns the TV and lights off .. nightie night .. I’m soon sound asleep. 23.06 .. We wake with a start .. a large explosion outside .. followed by a few more .. ruddy fireworks. Karen and I wait for Claire’s voice .. nothing. I drift off to sleep. Day 2769. Sunday 8th July 2012. From my Facebook page .. Was in bed, lights out at 21.30 slept like a log, except for being woken at 23.06 by a blast of fireworks ( that Claire slept through ). Haven't slept like that for soo long. Claire woke us for the first time at 06.15 ( that's amazingly good too ), I took some pain killers then slept till 08.05 .. strange thing is, I could sleep the same again now. Have managed one exercise this morning that shows I've got a load more movement over my head, but at the moment the pain is similar to under the muscle BA .. those who have done that will know what I'm feeling .. physio / nurse on Friday suggested it should feel easier "next weekend" .. working will be unpleasant, at least I can drive Violet with one hand. I'm on call next week .. oh what joy !!. I slept amazingly well ..
06.08 .. I’m awake and hear Claire moving, I’m in pain .. Karen sorts Claire out and I take a couple of Co-Drydamol .. I need the loo too .. I return to bed and drop off again. 08.10 .. Claire wakes us up .. I need to get up to eat and take more pain relief ..
11.55 .. I head for the shower ..
13.55 .. We head off to take Claire back, via waitrose in Sunningdale ..
15.48 .. We arrive at Northampton services .. the homes car is waiting for us ..
15.51 .. Back on the road for home .. my left arm and shoulder is seriously aching .. I try an extra cushion under my arm .. it doesn’t help a lot. 17.48 .. We are home ..
19.25 .. Dinner is served .. a bit of an odd mixture but it’s good .. followed by strawberries and ice cream .. Karen’s done it all. Day 2770. Monday 9th July 2012. 08.11 .. I’m heading for work .. hope I might find a colleague or two who'll be kind enough to relieve me of my on call requirement/commitment for a few days ..
A couple of kind colleagues have taken the load of on call off me until at least Thursday, that's a relief .. thanks Mel. Phone call at work today from Physio I saw post surgery on Friday, she wants to see me this Thursday, cannot combine appointments that are dealing with my breathlessness .. so more time of work and more 70 mile round trips. One thing I learnt today was the doctors order of not working overhead for 6 weeks applies to both arms, not just the operated on one, reaching up to change a light bulb this morning with my right arm sure made my left shoulder ache .. <<sighs >>. As for the exercises I've been trying to do hidden away from folk, in a racks room, toilet cubicles and a quiet nook in the office .. :-( .. life's like a headless bunch of roses, at least driving Violet Jazz with one arm and a knee is a doddle :-). 21.15 .. time for pills .. so going for another early night .. nightie night. Day 2771. Tuesday 10th July 2012. 07.38 .. There is a time when you realise being "Codeine sensitive" is really "Codeine intolerant" .. time to come off the Co-Dydramol, grit my teeth and rely on Paracetamol to keep me going between Volterol doses. Was warned days 5 / 6 would be worst .. not looking forward to Wednesday / Thursday, other than to get this all behind me .. :-(. 21.00 .. With pain numbed, I've been on the floor tonight to try and be a little more positive and correct in doing the stretching exercises for my shoulder, the alternative suggested methods of standing or sitting doing them ( as practised at work ) clearly make them a lot easier, or easier to cheat. What has surprised me most is actually the tightness under the arm and particularly the chest under the left breast .. oo er, that hurt. Clearly there is some work to do to get everything freely moving. I can't get my left arm as close to my ear as I can the right one, but with stretching, I'm hopeful it will. Day 2772. Wednesday 11th July 2012. 08.11 .. So I spent quite a bit of time looking for holiday inspiration last night .. Karen's been looking at cottages in Cornwall .. spend £800 a week for a place in the rain ? I've looked at maybe doing sunnier things .. a drive around Europe .. Austria, Switzerland, North Italy .. two weeks hire of a motorhome = £1800 basic for the hire alone .. Looked into cruises around med .. Karen's negativity around food poisoning and "it's for old folk" ..
Maybe time to look at doing my "yachtmaster offshore skipper" .. with Karen along to do "competent crew" .. starting to loose will to live. 22.12 .. Isn't it great .. ( NOT ) .. that the MOD is going to have to bail out G4S and those cretins in our Olympic organisers who clearly couldn't manage a "party in a brewery" who decided G4S can be trusted to get it right and "protect" everyone .. the same company being trusted by police forces to take over many police roles .. I bet in everything they do G4S "protect" a really big profit % in any contract .. profit from tax payers.